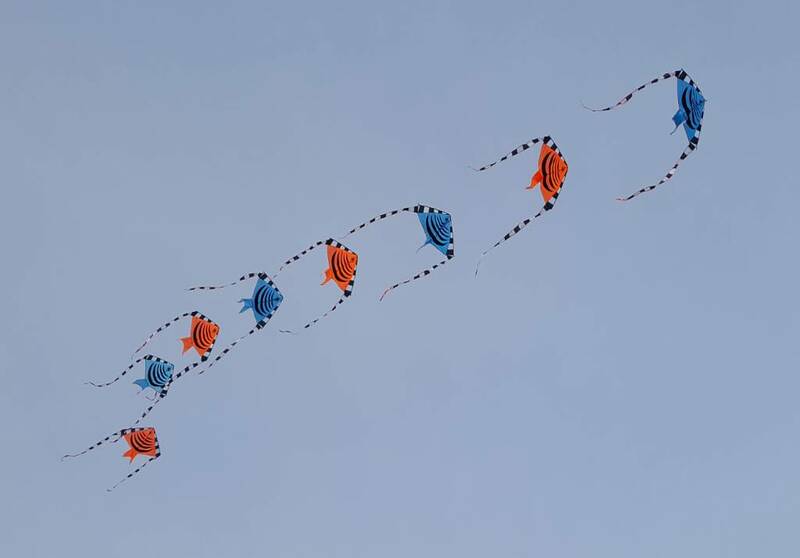 I have scored a few kites here in China, including a series of Delta Kites. I'm all about flying with toys on the lines, lights (at night), balloons, pinwheels, line climbers, and streamers. Problem is none of the single kites have the strength to lift the light toys (a chain of lightweight plastic lightsaber toys) that I'm trying to get airborn on their own. The solution is to train some kites together. So, how do I do it? Like I've tried to indicate below. SLKs are not my thing (yet?) so I'm not the most suited to giva any advice here unfortunately. However without a set of good quality photos that describes the parts involved in the problem-to-be-solved, the chance of getting good answers from anyone is reduced. Without any more details it is likely that you'll get only general answers. If you could deviate from the condition that you only could connect to one point on the previous kite (as expressed in the above ASCII graphics), there would be the common dual line stack way (the only way that I've tried). 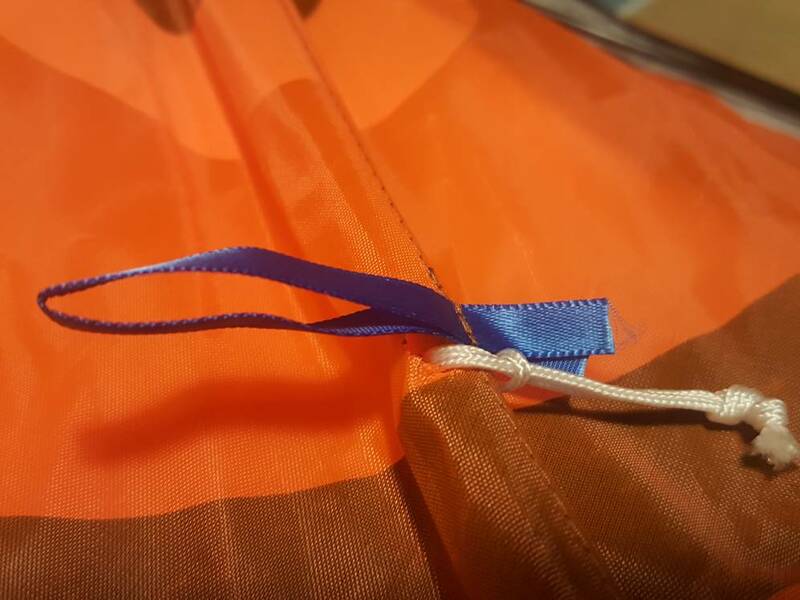 The typical way to create a DLK stack would be to connect the bridle attachment points to each other, thus reducing the load on the frame of the first kite. 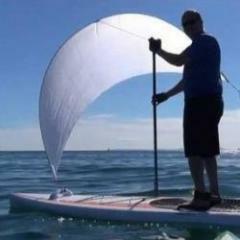 If the first kite still would have a too weak frame, a stronger frame (with or without a sail) could be put before the first kite. In the below image you can see the yellow lines connecting the two kites. 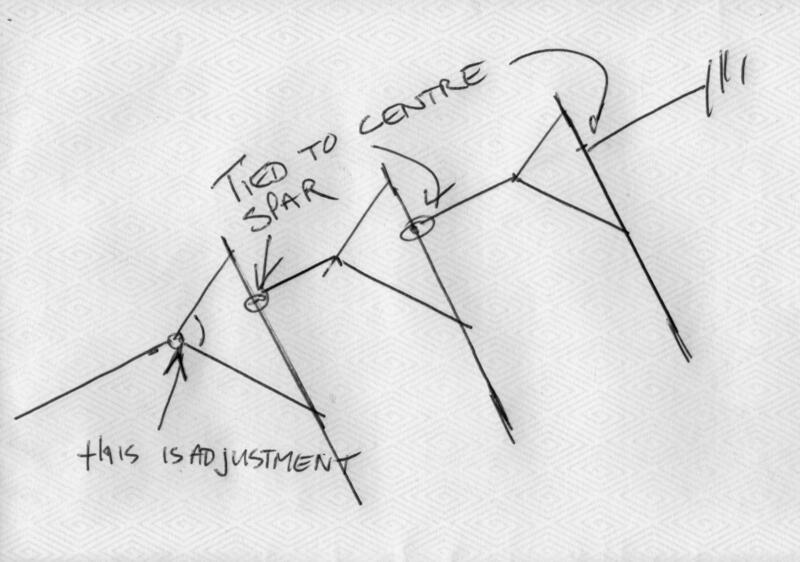 Add a extra bridle lines to the to the image above. These extra bridle segments should form a continuation of the kite line. In this way connecting the central point of the spars of each kite to the neighboring kites'. Let the kite line pass through all the sails except for the last kite. Then connect all the bridles of all kites to this line. 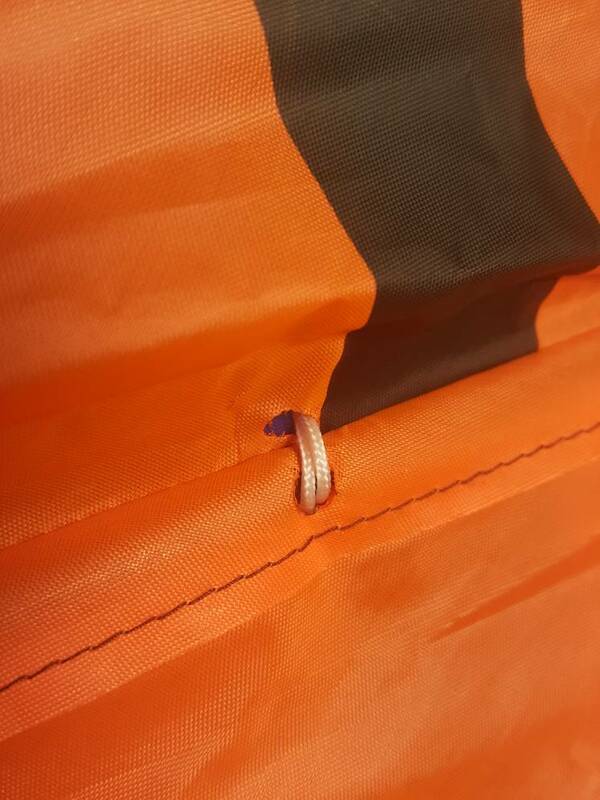 hole in the sail is an option but not all the time a good one depending by the kites design and bridle. Thanks All... I suspect the hole in the sail will be necessary. However, I'm worried about fraying. I'm now thinking of sewing a link from the keel, up and through the back of the kite. Melt a small hole, 1/16 to 1/8" diameter, through the sail and install a grommet. Will last forever. Not really, but 4X as long before it frays is about right as long as there is no lateral force on the sail material. 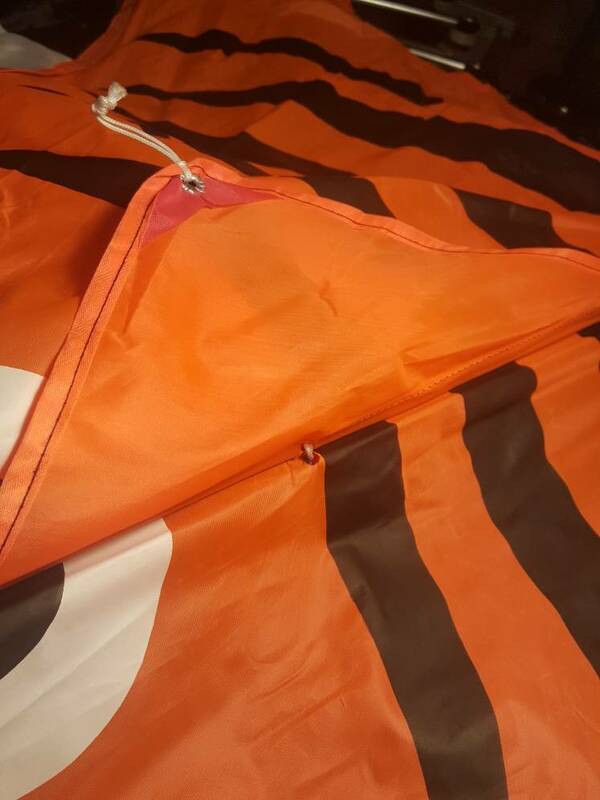 With lateral force the sail will begin to come apart at the outer corners of the frame. That might do it... If I can find a grommet around here. China is not exactly a shopper's paradise if you can't read the language (and have only 2 years of college Mandarin). 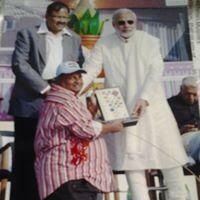 wow, you let us to give you all possible advice and you are in KITES COUNTRY ? Find and order it online. It's gonna ship from China anyway. So how did this project go? I didn't contribute as Makatakam and Edmonds answers pretty well covered things. I'll add a few pictures of one I did. I had to put 3 holes in each kite . 2 holes in the sail, one on each side of the spline, and 1 in the keel. 7' Pirate Rokkaku by Skydog Kites, roughly a $140 value! 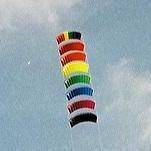 This package includes kite and sleeve only - lines and other accessories not included. Odds of winning for this prize is currently 1/357, and will be drawn on May 9th, 2017! I acquired a kite a few years ago, and have been trying to figure out how to put it together since I got it. So far I've had no luck. The kite is a Joel K Scholz Signature Series Delta; the 20' Raptor to be precise. It came with a bag of carbon rods, but they all seem to be different sizes. Do any of you happen to have plans, or a diagram that shows how to assemble one of these things? I'd love to put it together and see it up in the air. It looks beautiful. Thanks for any help! I appreciate your time. Single line AND dual lines kites ? Hello kite friends, I can't remember few days past I saw a dual-lines kite which can be flew as single line too. I guess it was a "Premier Kites" brand, but I'm not sure. Could you tell me what is this kite and a link to find it please ? Over this, what are the kites with this same ability, say what are the kites able to be single line as well as dual or even quad lines ?